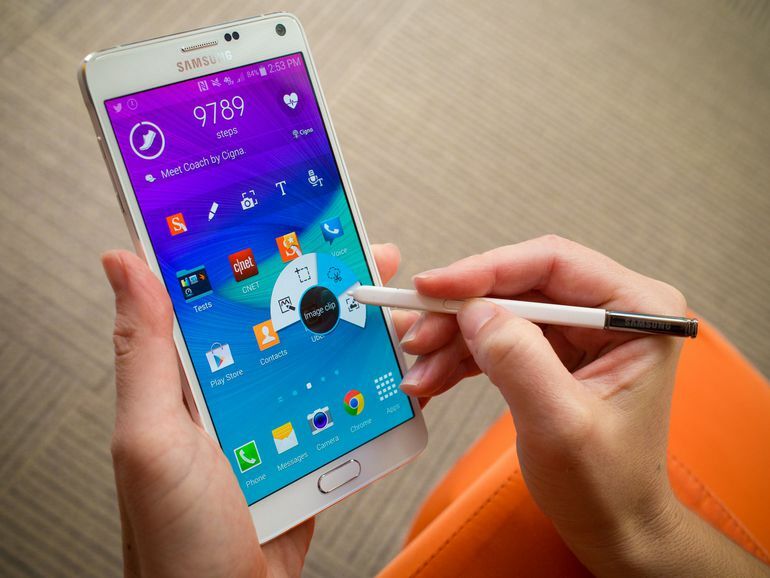 The Samsung Galaxy Note 4 was released on the October of 2014 as the successor of the Samsung Galaxy Note 3. The S pen stylus brings added functionality and lets users note everything precisely on the go. The smartphone has a 5.7 inch screen identical to its predecessor. However, with an upgraded resolution of 1440 x 2560 pixels (~518 ppi pixel density), it shows up a more vivid screen and crisp details. Furthermore, it offers a super AMOLED capacitive touchscreen with a Corning Gorilla Glass 4 protection and has a fingerprint sensor technology. It comes with an Android OS, v4.4.4 (Kitkat), upgradable to v6.0.1 (Marshmallow) and runs on octa-core (4x1.3 GHz Cortex-A53 & 4x1.9 GHz Cortex-A57) CPU with an Exynos 5433 chipset and a Mali-T760 MP6 GPU. The smartphone has a built-in storage of 32GB (expandable upto 256 GB) and a 3 GB RAM for massive storage and a seamlessly smooth operation, featuring a multi-window multitasking. Moreover, it offers a primary camera of f/2.2 16MP with Optical Image stabilization, autofocus and LED flash for brilliant day-time, as well as better low-light photos. Also, it has a dual video recording feature and can record videos of 2160p@30fps and 1080p@60fps. Similarly, the front camera of f/1.9 3.7 MP captures stunning selfies and videos of 1440p@30fps and 1080p (HDR). Additionally, the smartphone operates on a Removable Li-Ion 3220 mAh battery with fast charging feature ( 60% battery on 30 mins) ensuring a power-packed day. The Samsung Galaxy Note 4 is available at the price of Rs.68,900/- in Nepal. Although, originally during its release, it seemed to be a phone with value for money, with increasing competition, many other companies have been offering much better features for a similar price range. So, what are your opinions on this Samsung smartphone of 2014? Do let us know in the comments section below.